Replace the standard 1x2 red crowbar inventory icon with either a grey, green, black or red Schrade Tough® Mini-Crowbar 1x1 inventory icon. 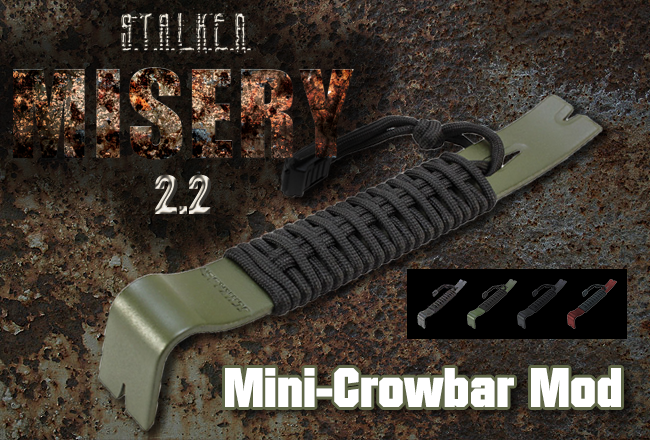 This mod allows you to replace either a grey, green, black or red version of a Schrade Tough® Mini-Crowbar 1x1 inventory icon for the standard red crowbar 1x2 inventory icon. This mod allows you to easily drag and drop the 1x1 mini-crowbar icon to one of the four function squares in your inventory for easier/quicker access. That's all. Instructions included. Enjoy. This is the greatest mod I've ever seen. Mad props on the artwork too. I like it. A crowbar that fits into my "pockets". Now my coins have a buddy to keep them some company. Also like the icon, great stuff. It's amazing! I have already added it to my loadout. Thanks a lot, brother! Glad you like it, Matt.. be well. The inability to shortcut to the crowbar always annoyed me so I look forward to playing your addon for my next playthrough. Thanks very much for sharing. You are very welcome. Be well. Does this mod still work with the new patch?